Arsenal and central midfielders. Central midfielders and Arsenal. It's a dance as old as time itself. For what seems like decades, Arsene Wenger has refused to dip into the transfer market to add force in the middle of the park, leaving fans frustrated. You all know the names. William Carvalho, Grzegorz Krychowiak, Victor Wanyama and plenty of others have been linked with the Gunners in recent seasons, only for rumours to result in nothing. But now, with Francis Coquelin and Santi Cazorla sidelined, Wenger has taken the plunge. Mohamed Elneny has finally sealed his move from Basel and will reinforce the Arsenal squad for the second half of the season. Elneny started his playing career at the age of six, when he joined Al Ahly in 1997. To pursue his footballing dream, he and his mother would have to wake up in the early hours of the morning to take a train from El Mahalla to Cairo, before then taking a bus to Al Ahly. They often wouldn’t return back to their hometown until late at night, but this gruelling daily journey helped shape Elneny as a player and a person. Despite being at starter at youth level throughout his time at Al Ahly, the club decided to terminate the midfielder’s contract in 2008. After this significant blow, he was then offered a chance at El Mokawloon SC, another Egyptian Premier League side, before finally getting his breakthrough when called up to the first team two years later. Soon Elneny was a regular in the El Mokawloon side, impressing with his consistency and tenacity whenever selected. His profile began to rise, and the then 19-year-old was called up to the Egyptian Under-23 national team to compete in the London 2012 Olympics, where alongside talented players such as ex-Basel winger and best friend, Mohamed Salah and the former Sheffield United and Hull City defender Ahmed Fathy, played in all four games before Egypt were knocked out by Japan in the quarter-finals. He then made his debut for Egypt in September 2011 against Sierra Leone - a game which Egypt lost. Elneny has gone on to make 39 appearances for his country, scoring three goals. After a ten-day trial during their winter break, Basel announced the signing of Elneny on a six-month loan deal in January 2013, before confirming in May that they had taken up the option of buying the Egyptian permanently after winning the league. Of the 68 matches the club played last year, Elneny featured in 55 of them, and missed only four league fixtures all season. The good news for Arsenal fans hoping to finally win the Premier League again this season is that Elneny is already a league title winner - he's helped Basel to the Swiss Super League for the last three seasons in a row. Although usually deployed in a deeper midfield position, where he can dictate the play with his metronomic style, Elneny is equally capable of playing in a variety of roles. He has featured as a box-to-box midfielder for Basel and even put in a few brief stints behind the striker when necessary. The 23-year-old has become known for his impressive range of passing, in addition to his ability to shoot from distance, with a number of his recent goals coming from outside the box. 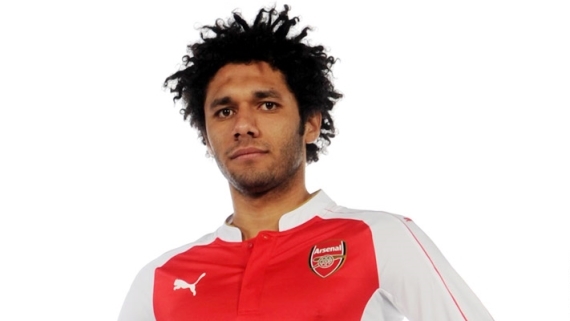 Elneny has also been Basel's designated free-kick and corner taker. But despite being technically accomplished, his stamina and strength really set him apart from the rest. Elneny was a standout player in Basel's Europa League group campaign this season, scoring twice in six appearances, including a thunderbolt in a man-of-the-match performance against Fiorentina. His passing accuracy of 92.4 per cent was the highest at the club by some distance, while he also ranked highly for tackles (2.4 per game) and interceptions (2.0 per game). He will provide much-needed cover for Arsenal in central midfield, both in the present and the future. The Gunners, often largely stacked with options in midfield are currently without Cazorla, Coquelin and Jack Wilshere due to long-term injuries, while the ageing trio of Mikel Arteta, Mathieu Flamini and Tomas Rosicky are soon to be out of contract. Elneny is a versatile player who could play across the midfield for the Premier League leaders, but it is likely that his arrival is to offer support to Coquelin as an extra defensive midfielder. The Egyptian will certainly have to adjust to the frantic speed of English football, but having only turned 23 in July; there is plenty of room for development. He is also a player who definitely has the raw abilities to be a success under the tutelage of Arsene Wenger. Elneny’s relatively low price tag of £5million gives a first impression of a lack of quality, but such conclusions should not be jumped to, as it appears he has the right make-up to slot in perfectly at The Emirates. The Egyptian’s six Europa League games this season compared with Arsenal central midfielders’ performances in the Premier League this campaign, make interesting reading. Elneny excels with his pass success rate of 92.4 per cent ranking higher than defensive midfield duo Coquelin (91.5 per cent) and Flamini (89.5 per cent). Calmness and confidence in possession is an essential attribute for Arsenal midfielders to have, especially when playing in central areas. The Gunners like to play with control and fluency; it appears Elneny’s attributes are well-suited to this style. Just six games is not a lot to base a player’s overall quality on, but it does give an indication to his style of play. If you ask FC Basel fans their opinion on the player, one of the first things they will mention is his phenomenal work rate. Arsenal fans love a player who works hard, with Joel Campbell and Alexis Sanchez often applauded for their visible extra effort on the pitch. When Aaron Ramsey is not present, the Gunners often lack energy in central areas. Elneny’s high work rate and impressive passing statistics qualifies him to play in both a holding midfield role and in a more advanced position. He is not of the physical stature that some fans would have hoped for in a new arrival. But he does offer an extra few centimetres in height over Coquelin, Arteta and Flamini. With Elneny’s attributes and attitude well suited to the club, if he can settle in London, the Egyptian could play a bigger role than most anticipate he will in this Arsenal squad.